For over a year now, it’s been clear that the election was Brian Pallister’s to lose. There are many reasons for this, but Pallister’s charisma and charm were never factors. Even though Pallister runs behind his party in terms of popularity, Manitobans so disliked Greg Selinger and/or the NDP that they were even willing to vote Progressive Conservative if that is what it would take to get rid of them. And vote Tory they did, giving the Pallister PCs 53.4% of the vote and 40 seats in a 57-seat legislature. While the NDP were reduced to 14 seats, the Liberals overcame the many rookie gaffes of the feckless Rana Bokhari to win three seats. Even the Greens saw an improvement in electoral fortunes, very nearly winning the riding of Wolseley, long an NDP stronghold. Not surprisingly, anxiety stalks the land — at least that portion of it occupied by folks who believe in a major role for the public sector and/or those who depend upon it for programs, services and employment. That fear is probably justified. Tory times typically have been tough times and Pallister’s promises to protect the jobs of front-line government workers have not been particularly convincing. Still, as challenging as this situation is, I think it offers some exciting possibilities for Manitoba’s Left, broadly defined. For progressive thinkers within the NDP, the party’s electoral humiliation offers the opportunity for critical reflection and the possibility for renewal. This will not be easy in a party that is as divided and beaten up as this one has been. It will take years and a willingness to confront some ugly truths about what the party has allowed government to do in its name. I hear distant rumblings that this process is beginning. Unaffiliated Lefties are faced with choosing between involvement in party politics (and not just within the NDP) and perhaps escalating their involvement in movement politics (labour, indigenous rights, environmentalism, human rights, peace, feminism, LGBTQ, etc., etc.) A new player is emerging on the scene called Solidarity Winnipeg which seeks to unite progressive elements to oppose the anticipated Tory austerity project and promote the Leap Manifesto. It is early days for Solidarity Winnipeg, but I’m reminded of CHOICES!, a loose association of lefties that did some very creative and productive political work in the 1990s but dissolved as soon as the NDP regained power. Another choice for progressive Manitobans lies with the Green Party of Manitoba. While it is fashionable in some Left circles to dismiss the Greens as “conservatives who compost,” this criticism is usually made by people who have not taken the time to read, much less understand, the party’s platform. (Full disclosure: I’ve been a Green for a few years now.) If they had, they would easily conclude that federally and provincially the Greens are to the left of the NDP on most issues. In Wolseley, the provincial riding where I live, we doubled the Green vote and very nearly toppled the NDP incumbent. Greens made gains in numerous other constituencies as well. Our growth was based, I would argue, on a platform that was fundamentally more progressive than anything on offer from the other parties. These gains show that there is a growing appetite for a politics that promises to care for the earth while caring for each other. What’s a Lefty to do in Manitoba? You’ve read my take. I’d love to read yours. 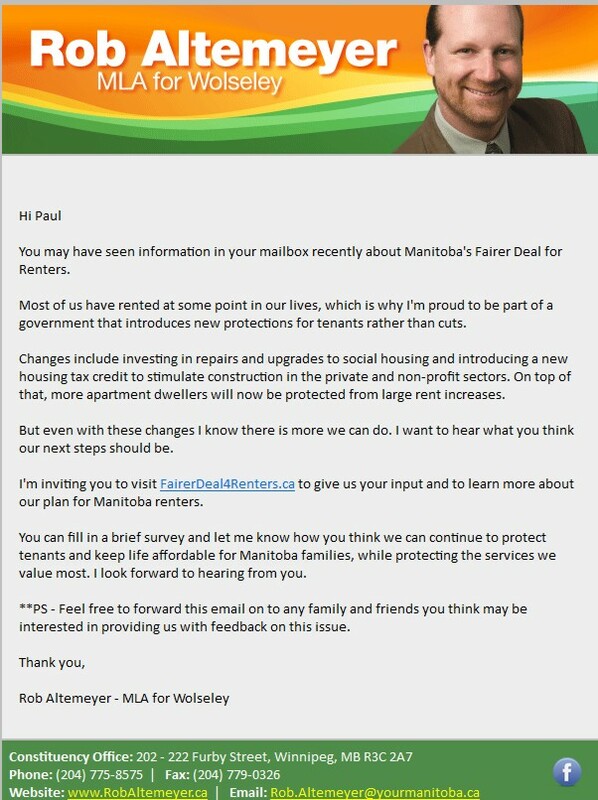 I wonder how many Manitobans have received an email from their Manitoba NDP MLA entitled “A Fairer Deal for Renters.” I wonder how many are as pissed off as I am about what it represents. 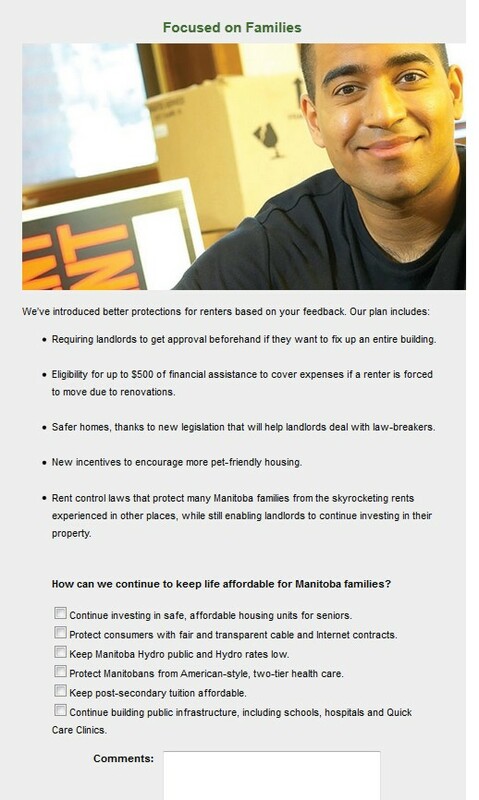 You may have seen information in your mailbox recently about Manitoba’s Fairer Deal for Renters. Most of us have rented at some point in our lives, which is why I’m proud to be part of a government that introduces new protections for tenants rather than cuts. Changes include investing in repairs and upgrades to social housing and introducing a new housing tax credit to stimulate construction in the private and non-profit sectors. On top of that, more apartment dwellers will now be protected from large rent increases. But even with these changes I know there is more we can do. I want to hear what you think our next steps should be. I’m inviting you to visit FairerDeal4Renters.ca to give us your input and to learn more about our plan for Manitoba renters. You can fill in a brief survey and let me know how you think we can continue to protect tenants and keep life affordable for Manitoba families, while protecting the services we value most. I look forward to hearing from you. **PS – Feel free to forward this email on to any family and friends you think may be interested in providing us with feedback on this issue. At first glance, it appears rather innocuous — an MLA informing his constituent of new government initiatives and inviting input into future policies that will help tenants and other Manitoba families. If you didn’t follow up on the opportunity by clicking on FairerDeal4Renters.ca, you might think that it was a genuine invitation. You might think “How thoughtful of him to ask. I feel so included. This government really cares!” You might. I clicked on the aforementioned link and found myself — not on a page dedicated to tenants’ interests, as one might have suspected from the name of the link — but on a page on the Manitoba NDP Caucus web site. As promised, it provided a bit more information on how life had gotten better for Manitoba tenants. Then came the survey — and this is what pissed me off. How can we continue to keep life affordable for Manitoba families? Continue investing in safe, affordable housing units for seniors. Protect consumers with fair and transparent cable and Internet contracts. Keep Manitoba Hydro public and Hydro rates low. Protect Manitobans from American-style, two-tier health care. Continue building public infrastructure, including schools, hospitals and Quick Care Clinics. Nowhere is there an opportunity to comment on the plethora of genuine issues and policy concerns that would impact on tenants in particular or citizens in general. Instead we are presented with a tick-box menu of vaguely worded motherhood statements that reflect existing government policy, with a text box at the end for comments. This is not consultation. It is pre-election propagandizing. 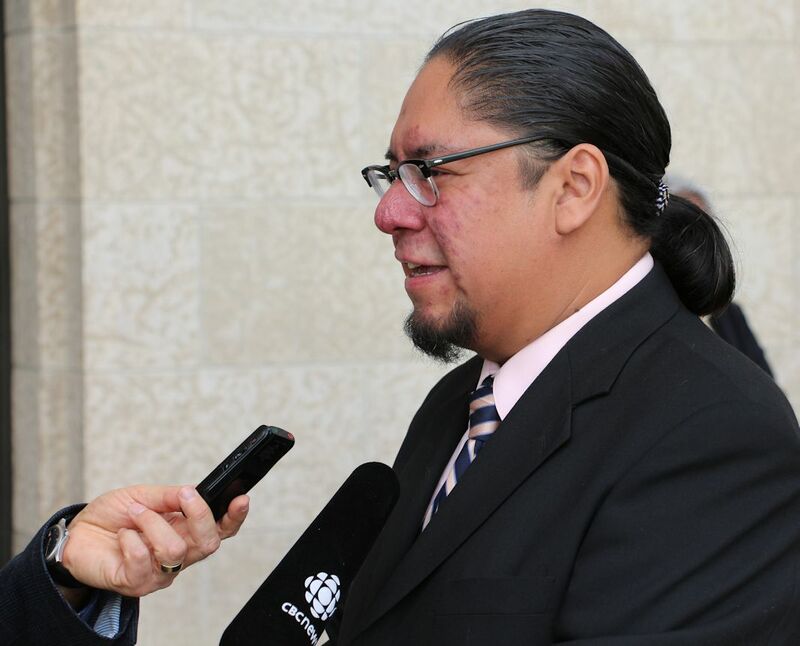 The Manitoba government did something similar in the lead up to this year’s provincial budget. I wish I could say I was disappointed, but this bogus, tawdry, cynical approach to “consultation” is well established. Everyone does it. Governments, corporations, political parties. They smile, appear concerned and insult our intelligence on their way to the bank. The NDP is hardly unique. No wonder voter turn-outs are in decline. Until political parties learn to engage honestly with citizens, our democracy will continue to wither. Fracking is a process used to extract oil and natural gas. It involves drilling horizontal wells into rock formations and injecting a mixture of fresh water, chemicals and sand under high pressure to fracture the rock and release the oil and gas. Fracking has been linked with contaminated water aquifers, air pollution and earthquakes. In Manitoba, the gas extracted with the oil is hydrogen sulfide, a toxic gas that is lethal in small concentrations. The gas is burned off and returns to earth as sulphur dioxide, also known as acid rain. Last year in Manitoba, 570 new horizontal wells were drilled, and more than 600 are projected for 2013. This presentation was sponsored by Idle No More Manitoba as a part of its Red Feather Campaign in solidarity with the people of Elsipogtog, New Brunswick, who have been resisting plans to frack for oil in their territory. The presenter, Dennis Le Neveu, is a retired scientist who has written on this topic for the Fall 2013 edition of Eco Journal, published by the Manitoba Eco-Network. It was recorded on Oct. 26, 2013 at Neechi Commons in Winnipeg. Make Poverty History Manitoba rallied at the Manitoba Legislature on Friday to demand that the provincial government increase the rental allowance provided to recipients of provincial Employment and Income Assistance (EIA). 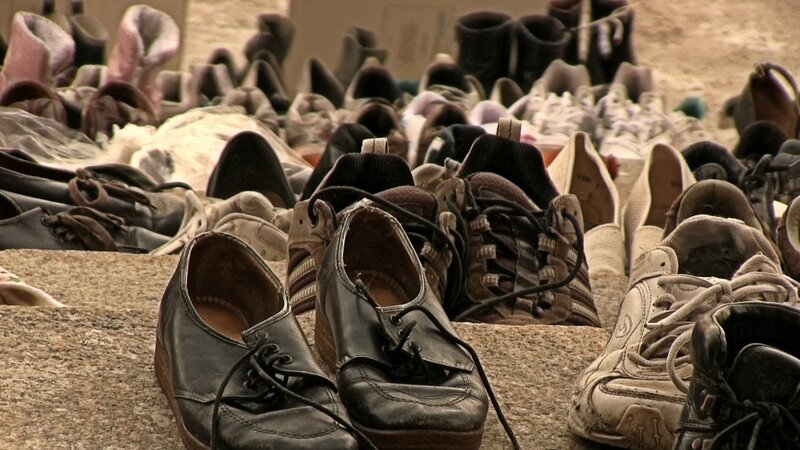 Recalling the kindness of a Winnipeg Transit driver who gave a homeless man a pair of shoes, demonstrators left dozens of pairs of shoes on the steps of the Legislature to send the message that they no longer wish to depend on isolated, random acts of kindness. EIA recipients are provided with a rental allowance that has increased only slightly over the past two decades. During that same period, rents have gone up by 60 to 70%. According to Kirsten Bernas, Make Poverty History Manitoba is asking the Province to increase the rental allowance to 75% of median market rent, a move the provincial government estimates would cost approximately $18.5 million annually. In this video report, Ms. Bernas explains why this increase is long overdue. According to the Social Planning Council of Winnipeg, “While the national poverty rate has remained relatively stable since 2006, the child poverty rate in Manitoba has been gradually increasing and remains 6.4 percentage points higher than the national average.” The SPCW reports that Manitoba had the second highest child poverty rate in Canada in 2012, with over 20% of our children (about 54,000) living below the poverty line as defined by Statistics Canada’s Low Income Measure After Taxes. Winnipeg Harvest provides emergency food assistance to nearly 64,000 people a month across Manitoba. Therefore, Winnipeg Harvest clients are Manitoba’s second-largest city. This figure is up more than 14% over the same period last year. More than 47% of its clients are children. For each of the last two years, Manitoba is the #1 province for food bank use. Winnipeg Harvest feeds more 30,000 children each month. Ten years ago, that number stood at 5,500 children. Seniors and refugees have more than doubled in food bank use since 2010. 1/3 of families experiencing hunger are dual wage-earner families, i.e, the working poor. The authors appear to believe that poverty rates in Manitoba are shrinking; they make the claim that the number of Manitobans living in poverty went down by 6,000 between 2000 and 2009. Research from the above-cited sources suggests that the opposite trend is more likely. There are no concrete goals against which the government’s performance can be evaluated. Instead, we are given vague indicators against which progress will be measured. A second reading of the strategy reveals it to be a glossy, feel-good kind of document which does little to instill confidence that the provincial government is seriously committed to poverty reduction. But don’t take my word for it; read it yourself. Manitoba’s child poverty rates have remained above the national rate since 1989 when Canada’s House of Commons passed a unanimous all-party resolution to eliminate child poverty by the year 2000. 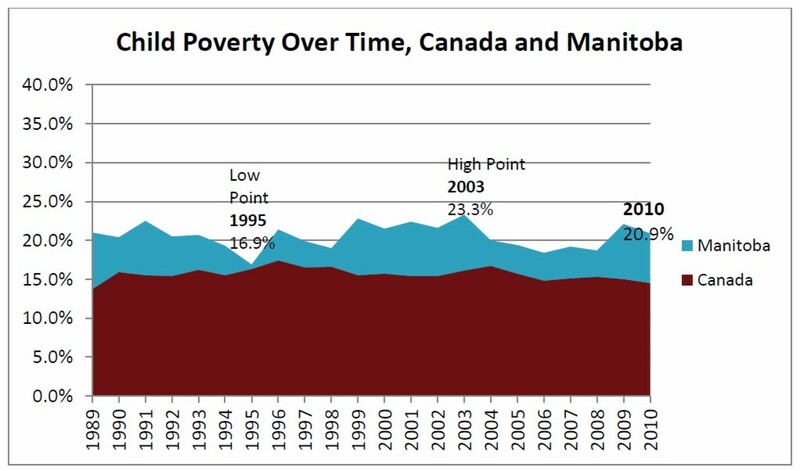 Canada’s national poverty rate remains pretty much where it was in 1990. In 2009, the House passed another unanimous motion to “develop an immediate plan to eliminate poverty in Canada for all.” The Manitoba government seems to have bought into the legislative zeitgeist. However, unless there are some significant changes in their approach, nothing will change. The rich will get richer and the poor poorer — all of this occurring in the heartland of one of the wealthiest countries in the world. A good place to start would be to acknowledge that poverty is growing and to act accordingly. This would include setting real goals and dedicating more resources to meet them. It would also mean backing away from its failed strategy of regular tax reductions so we have more resources to allocate to alleviating poverty. It would mean educating the public about the true nature of poverty and taking the risk that an honest dialogue would win over all but the most diehard reactionaries in the province. Finally, for starters, why not increase the funds allocated to housing in the EIA budget, so that disabled, unemployed and other immiserated Manitobans don’t have to choose between paying the rent or putting food in their bellies? Despite its well established habit of electing social democratic governments, Winnipeg has claimed some dubious honors — “Murder Capital of Canada” and “Child Poverty Capital of Canada” to name two of the most disturbing. Even though we have had 11 years of NDP government to undo the damage of Gary Filmon’s Conservatives, both poverty and crime are well entrenched in Manitoba, especially in Winnipeg. The Council says these statistics have not changed significantly since 1989, the year the House of Commons pledged to end child poverty in Canada by the year 2000. What is to be done? According to the Manitoba Green Party, 80 per cent of all expenditures on social assistance programs are consumed by government bureaucracy. They proposed, in the last provincial election, to replace welfare benefits with a Universal Basic Income benefit, payable to all Manitobans, that would ensure no one slipped below the poverty line. The idea has merit and I hope the Greens continue to explain and promote it. Yet another group of Manitobans proposes a package of measures they call a “Justice Charter to End Poverty in Manitoba.” I’ve included it at the end of this piece. 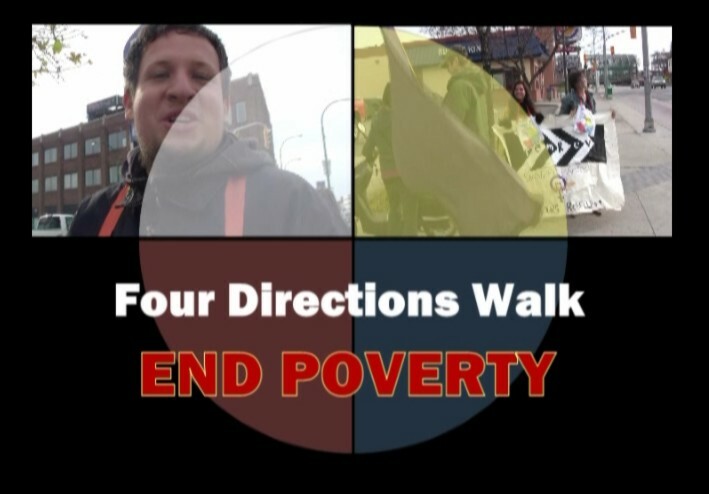 They also hold an annual event called the Four Directions Walk to End Poverty in which four contingents begin their walk on the outskirts of town and converge on the Manitoba Legislature. They held their fourth such walk on Saturday, Oct. 22. Naturally, I brought my video camera. Housing must be a right and a comfort, not a constant crisis! End subsidies to private landlords. Enact a Tenant Bill of Rights. Build and maintain public housing to the standard building code. 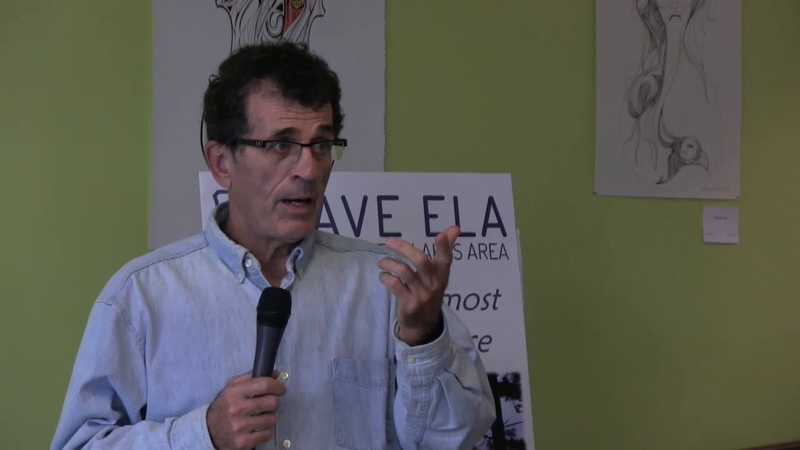 No utility cut-offs; establish a panel with legal power to require landlords to pay. Universal health care for all, for every need! Expand medicare into a comprehensive health care system focusing on prevention. Extend medicare to cover all essential needs such as eye, drug, dental, ambulance and prosthetics. Reduce pollution from mining and manufacturing, especially next to low income neighborhoods. Jobs are a human right. Create good-paying jobs for all! Create jobs through a massive investment in public housing, a public child care program, and conversion to a “green” economy. Increase the minimum wage to $14 an hour. Quality job creation by ensuring access to education, ending tuition fees, free student housing, education in Aboriginal and any other language where numbers warrant. Access to better jobs – reduce the work week with no loss in pay, add paid vacation days and reduce the pension age for women to age 60. End the Foreign Temporary Worker program, give these workers full labour rights and make them immigrants to Canada, if they so choose. Provide for those in need! Introduce a Guaranteed Liveable Income, above the poverty line and indexed to inflation. Improve special needs benefits and introduce a fast appeals process with free advocacy services. A public, high quality, free child care program employing well-paid early childhood development professionals. Establish a hot breakfast program for children in schools. For injured workers, establish a fast and free appeals process independent of the Workers Compensation Board. Provide free legal services and always respect the right to appeal. Establish a Manitoba pension credit plan funded by payroll deductions, a surtax on corporate income to top up pensions above the poverty line and an inheritance wealth tax. Establish a federally-chartered, publicly-owned bank that does not discriminate against people in poverty, is located in low-income areas, and provides free or nonprofit cheque cashing services and international fund transmittals. Establish a province-wide, free and publicly-owned handi-transit service for people with disabilities. Establish price controls for essential foods throughout Manitoba. End racism, sexism and discrimination of all forms! Support immediate settlement of Aboriginal land claims and emergency action to end housing, health care and education inequality. Take steps to recognize Aboriginal nations on a new basis in Canada, including full national rights and equal nation to nation relations. Introduce immediately affirmative action hiring with mandatory quotas for Aboriginal people, people of colour, women and people with disabilities in both the public and private sector. Job pay equity for all workplaces. Replace the present legal system of retribution and punishment with principles of restorative justice – restitution and reconciliation; include “ability to pay” as a consideration for sentencing people to jail for nonpayment of fines. Ban discrimination based on social or mental health conditions in the Human Rights Code. Introduce a Manitoba Bill of Rights based on the Universal Declaration of Human Rights (1948), adding protections against all forms of sexism. Establish proportional representation so that people will vote for what they want and so that every person’s vote will count. Pay Legislators the average worker’s wage and benefits in Manitoba. To establish a Four Directions Walk in other Manitoba communities. To discuss the Charter and send us your ideas. Contact us if you would like to receive information on the annual Walk, held on a Saturday close to the International Day for the Eradication of Poverty (October 17).